A letter of inquiry about the proposed Ford Buildings. 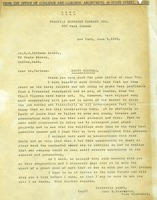 Harry J. Carlson asks Bessie Bonner to send Martha Berry's New York address. This copy of a letter states that they are sure that pictures of the Berry Schools have been published in the Gerogia press so the cannot see why pictures shouldn't be published and do not understand the policy of the Schools. Mr. Carlson sends Miss Bonner a list of people that have donated money to a Newton charity. Mr. Liebold lets Martha know that construction will proceed on the Girl's Dormitory, however, plans need to be changed prior to construction. Mr. Liebold informs Mr. Carlson of their current plans on travel for the early part of January. 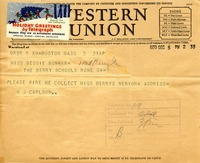 Mr. Carlson writes to say that he is glad to hear from Miss Berry and hopes that all with her and her niece is going well. He also asks if Miss Berry has sat for her bust. 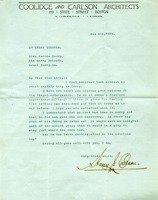 Harry J. Carlson encloses a copy of a letter from John E. Bierwirth, Thompson Starrett Company vice president, commenting that Coolidge and Carlson are in the process of arranging a significant contract to work with Thompson Starrett. Carlson asks Berry to report on her visit to Detroit. 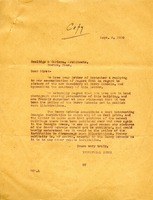 A copy of a letter sent to Berry by Coolidge and Carlson, Architects. 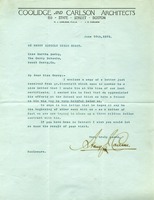 John E. Bierwirth, Thompson Starrett Company vice president, writes to architect Harry J. Carlson that Thompson Starrett understood that their contract with the Berry Schools would not prove financially profitable, but that they are happy to have worked on the project with Coolidge and Carlson and with Martha Berry. Bierwirth adds that he hopes to be able to work with Coolidge and Carlson in the future. 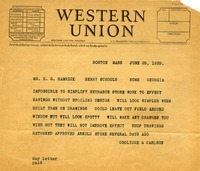 Coolidge and Carlson is surprised to have heard from E.H. Hoge that he did not have records for approved extras as copies had been sent. 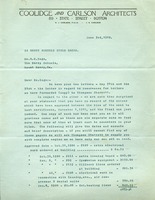 The letter summarizes the charges and offers to have Thompson Starrett re-send copies if Hoge cannot find his. Hoge is also asked to consult with Mr. Skinner about window shade holders. 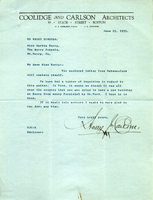 Architect Harry J. Carlson asks Martha Berry for her opinion of the chapel enlargement, which he thinks is an improvement and looks as it were there before. He asks whether the new dormitory, which Mr. Ford has elected not to fund, might still be a possibility. 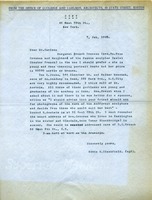 Artist Edwin H. Blashfield writes to architect Harry J. Carlson that he prefers Margaret French Cresson as a sculptor for a portrait bust, but also recommends Tom H. Jones, Walker Hancock, and Edmond Amateis.